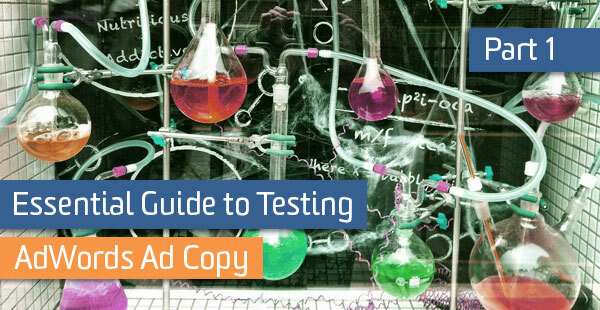 Writing and testing great AdWords ad copy is like running a never-ending science experiment. No matter how many times you optimize your text ads, there is always something you can tweak or test. With so many options for testing, managing ad performance can be overwhelming. Fear not! I’ll walk you through some basic ad testing concepts to implement in your PPC campaigns in our two part series. Always think about starting your A/B testing immediately. Planning ahead ensures early data collection and will help you achieve significant results in a shorter span of time. If you already have an existing campaign that you aren’t testing in, don’t stress. Identify the big-spending ad groups and prioritize those first. This allows you to optimize the ad groups that spend most of your money and also collect more data for analysis. While it might be tempting to test everything at once, it is more valuable to test one variable for a sufficient length of time. This will give you meaningful data and leave you with no doubt as to what caused the change in performance. If you want to read more about why this is important, Sayf Sharif has a great post right here on our blog about best practices for A/B testing. The headline, in all its clickable-blue glory, is the first thing a user will read after performing a search. With so much competition on the search engine results page, it is imperative that you seize the opportunity to make a good impression. And with only 25 characters to work with, you can’t afford to waste valuable space. Notice the change? Although we refer to our sessions as “trainings,” they could also accurately be described as workshops. Make your headline as concise as possible, playing with different descriptions of your product or service. What sounds great to you might not resonate with the user, and since they’re ultimately the ones paying the bills, it’s always a good idea to listen to what they vote for with their clicks. With 35 characters per line, you have slightly more wiggle room than with a headline, but not much. You still need to highlight your product, offer, or services as succinctly and accurately as possible. Product/Service Features: Try testing different combinations of benefits and features to find what works best. Call-to-Action: Another way to test a description line is with different calls-to-action. We recommend using a strong call-to-action in all ads, but sometimes what you think is a CTA worthy of revolution (or at the very least, a click), might actually be a dud. The beauty is that there are several different ways to test a CTA. You could combine the pricing suggestion above by including prices, savings, or other promotions. It is also important to test different verbiage and grammar. Try different verbs to see which one resonates with your target audience. Combining this with rhetorical devices, such as asking a rhetorical question before the answering call-to-action, can result in a powerful advertising concoction. It’s not only what you say, it’s how you say it. User Intent: Don’t be afraid to test whole concepts, either. For example, consider user intent. If your keyword is [laptop computers], the search is ambiguous; do they want to check out reviews and compare prices, or are they ready to purchase? You could tailor two ads to each of those intents, then identify which has the higher CTR to better target the needs of those users. Best Buy is banking on the searcher wanting to buy immediately, while HP believes the user wants to learn more about its different models first. This often gets overlooked, but still provides some interesting opportunities for testing. Users like to know where they’re heading, and the closer your URL matches the intent of their search, the better. Try testing out different keywords or locations in the subdirectory section, or perhaps eliminate them altogether in favor of a simple URL if you think your brand is strong enough (Ex: www.bestbuy.com/iphone versus www.bestbuy.com). That’s a bold strategy, Cotton. Rotate Evenly: This option rotates each ad in the ad group evenly, without any regard for performance. After 90 days, however, AdWords will automatically begin to optimize for clicks. If you feel you need more time to collect data, then the second option will be more your style. Rotate Indefinitely: Like the first setting, this one rotates each ad evenly, but will continue to do so for an indefinite amount of time without optimizing. Take note of the ominous warning: “Not recommended for most advertisers.” If you use this setting, it’s important to stay on top of your test. Failing to do so could potentially mean losing money, since lower-performing ads will be shown as often as higher-performing ones for the duration of the campaign. Do NOT set it and forget it! Be patient with AdWords ad testing. Although you might notice an initial dip in performance, you’re investing in better future performance. Give it time, analyze and optimize. Ready for Part 2? Check it out here.